GPR provides the benefits of being nondestructive, non-disruptive to the traveling public, and offers complete coverage. The pavement thickness measurements from GPR are typically found to be within 10% of core thicknesses. One of the leading subsurface detection firms in the nation, Infrasense, has recently completed the subsurface pavement structure evaluation of approximately 79.93 lane-miles of public roadways in Falls Church, Virginia using Ground Penetrating Radar (GPR) testing to determine the thicknesses of the pavement structure layers. It was performed along the centerline of each roadway, centerline of each lane, and at an offset approximately 1 foot from the outside edge of each lane. The resulting pavement structure information was integrated into the Falls Church Pavement Management System, and will be used for programming future rehabilitation efforts. 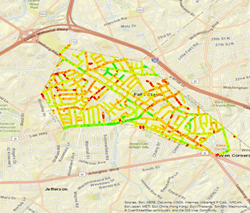 The survey was carried out at the posted speed limit for all roadways, and the entire Falls Church network was covered in only 3 days. The GPR data was collected with concurrent distance data via a wheel-mounted encoder and differentially corrected GPS data. GPR provides the benefits of being nondestructive, non-disruptive to the traveling public, and offers complete coverage. The pavement thickness measurements from GPR are typically found to be within 10% of core thicknesses. Ground penetrating radar operates by transmitting short pulses of electromagnetic energy into the pavement using an antenna attached to a survey vehicle. These pulses are reflected back to the antenna with an arrival time and amplitude that is related to the location and nature of dielectric discontinuities in the material (air/asphalt or asphalt/concrete, reinforcing steel, etc.). The reflected energy is captured and may be displayed on an oscilloscope to form a series of pulses that are referred to as the radar waveform. The waveform contains a record of the properties and thicknesses of the layers within the pavement.